PART 1.2 - SWISS "GHOSTS"
My involvement with the following events began on a sunny spring day in May 1996 with a telephone call from an Australian, Peter Johnston. He had read an article I had written sometime earlier, that reviewed the Bank of England’s “whitewash” report into the collapse of Barings Bank. Peter clearly felt that my critical examination of the Barings fiasco demonstrated an independence of mind that he believed was necessary to fairly investigate his own story. Within a week, Peter arrived at my house laden with documents and fears for his future. The prospect of being found guilty in his upcoming trial was a debilitating thought that visibly played on his mind. He set about showing me his papers to demonstrate his innocence of the charge against him. I was quickly impressed by his openness and honesty and his willingness to field any questions I threw at him and found it hard not to warm to him. He left an hour or more later with a promise to mail me copies of the most important papers and documents from his files. These arrived a week later and I began contacting some of those involved in his negotiations to buy the mysterious gold certificates. 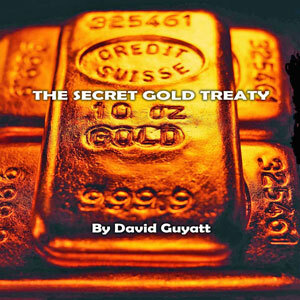 Unfortunately for Peter, his story of the Secret Treaty gold proved too complex for me to reach any real judgments about the validity of his case in time for his trial. His barrister opted – wrongly in my view – to defend Peter without submitting as evidence any of the thousands of pages of correspondence, contracts and other paperwork that Peter had available in his files. He was convicted and sentenced to two years’ imprisonment in Ford Open Prison. Throughout the Winter of 1996, I continued investigating Peter’s strange story whenever the chance presented itself. I also arranged to visit him in prison to ask additional questions. I hoped to interest a TV production company in making a TV documentary to cover the costs of overseas travel and other necessities that form part of a detailed investigation. This was not to be, and a shoestring research budget has been the order of the day throughout these past four years. Just before Christmas 1996, Peter arranged for me to pick up all his files that were available in the UK. These proved of great interest and enabled me to advance along slightly different avenues of investigation. Then, after serving twelve months in Ford Open Prison, Peter returned to his native Australia and, thereafter, forwarded another large batch of documents for me to examine. These were crucial to a clearer understanding of this complex story. Despite a very large volume of daily correspondence, business contracts and other documents that ran into several thousands of pages, each of which had to be read and assessed, I was able to cull a significant batch of what seemed to me to be absolutely explosive documents. Meanwhile, a friend who was one of the few to know of my ongoing research put me in contact with a British businessman who also had been dealing in gold originating in the Philippines. Gradually, I learned about the intricacies of the international black market for gold and discovered it was habituated by shadowy individuals who had intelligence connections and backgrounds. Others seemed to rub noses with members of organized crime or to be part of an international network of scammers and confidence tricksters. The involvement of the Sicilian Mafia is of considerable importance, also. By and large, honest businessmen don’t stand a chance in this world, as the circling sharks are sensitive to every morsel that isn’t properly anchored and protected and consume it in voracious frenzy. What follows is the result of over four years of often tedious work. It is my belief that the Secret Treaty story you are about to read unveils financial secrets so large that many will find it just too incredible to believe. But true it is. However, for doubting Thomas's everywhere, I have left a research trail of footnotes and other sources and a small but powerful battery of original documents that should enable anyone who wishes to follow in my footsteps to reach his or her own conclusion. The guiding principle that I have adhered to throughout my investigation into the black market world of gold is an old one: "follow the money." I first came across this advice in the revealing book Ratlines by Mark Aarons & John Loftus. With a City [London] background in international finance, this struck me as an impressive piece of advice. It suggests that the underlying --and often concealed -- motive behind almost every major scandal is money. One of the biggest surprises during my research was my incredible discovery that the official gold figures are pure nonsense. Representatives of the gold industry from the Bank of England through to the London Bullion Market Association and the World Gold Council kept making the point that only a tad over 100,000 tonnes of gold had been mined in over six thousand years. In fact, the actual official figure today is closer to 140,000 tonnes - but still a long way short of reality. This disparity soon became a sort of background "hiss" to my investigation. I would phone a source in the "unofficial" gold market and during the conversation I would be told how little gold had been mined historically. This refrain was repeated so often without my asking the question that I was led to investigate the figures touted by official sources. It immediately became evident that the pre-American Gold Rush statistics were badly flawed -- probably designer-flawed. Over the next few years I concluded that the official figures were designed to conceal what I believe is one of the biggest secrets of finance, namely, the sheer abundance of gold. This may not strike some readers as greatly significant, but it should, for reasons that I hope will become clear. The world’s central banks still use gold as a reserve asset and the obvious dilution of this underlying asset is of the very greatest significance. Moreover, very large quantities of this "black" gold have been -- and still are -- controlled and moved around the world by forces that are fascist or so ultra right-wing as to amount to the same thing. There are a thousand important stories "out there" and many of them don't get the depth of coverage by the media that one might hope for. Admittedly, a small group of hard-core journalists, writers and other investigators do expend considerable effort chasing these stories, but their rewards are sparse. The major media just are not interested. Often, what appears to be a lack of interest is, in fact, a case that the financial or monetary interests of the corporate media often deeply conflict with revelation of the truth -- as was the case when media magnate, Rupert Murdoch tried to inhibit critical reports about China in his newspapers that, clearly, would have impacted negatively on his business entanglements in that country. The lack of interest by the media in this subject has led to this story being privately published in the form of an electronic-dossier via the medium of a CD. The reasoning for this form of distribution is simply that publishing the material in hard copy -- and then airmailing it overseas -- is prohibitively expensive. The United Kingdom is one of the most expensive places to live in the developed world and has been, for a great many years, dubbed "Treasure Island" by transnational companies that double, triple or even quadruple their prices when selling through UK outlets. It is appropriate at this point to acknowledge my sincere gratitude to Carolyn A. Betts of Solari.com who graciously agreed to act as editor of this manuscript. Her sharp legal eye and stalwart attention to detail has proved invaluable. Thanks also go to Solari’s webmaster, Ozzie, for his patience and considerable assistance in making the final HTML presentation of a high standard. It would be remiss of me not to mention my son, Ben, and his cousin, Stephen, for doing a huge and quite brilliant job - under extreme time pressure – in designing the HTML layout for this manuscript and for my related website www.deepblacklies.co.uk. Not least, thanks must go to Catherine Austin Fitts, also of Solari, for agreeing to promote and distribute this work and for her encouragement and thoughtful patience during those periods when, under the emotion of frustration, I wanted to rip my hair out.